Falcon Scapes Vol2 contains a wealth of soundscapes, multi-sampled and synthesized pads, icy, abyssal and ominous drones, minimal and edgy sequences, impacts and stabs, beautiful cinematic textures, wondrous and haunting tones and some extraordinary dry and processed samples of sound sculptures made of huge springs, tubes and pipes. Processed vocal sounds and some ethereal choir textures perfect this library to the max. Often granular textures and sample maps are layered with Falcon’s internal sound generators creating dense and fascinating sounds usable for a wide variety of genres. Quite a few samples were borrowed from the patchpool Iris subscription-library, all other samples were created exclusively for this library. Many presets make use of Falcon’s multi-granular and sampling engine and there are also patches included using the wavetable, FM, pluck and analog oscillators. Many of these presets are running in split mode and/or layer sound textures via key-switches. Up to 25 Macros and switches plus the modulation wheel are assigned in each patch, many also use aftertouch, providing detailed control over volume envelopes, filtering, amplitude and pitch modulations, EQ-ing, dynamics, stereo animation, effects and more. Often complex tempo-synced modulation assignments are programmed so that these patches can provide interesting rhythmical animations. All patches use some sort of background image in the UI, split patches have colored key-zones in the Falcon keyboard for easier navigation. 1.67 GB of samples (115 wavs/stereo/48 Khz/24 Bit), 12 background images for the UI and wavetable re-synthesis, 8 single cycle waveforms, 2 wavetables. 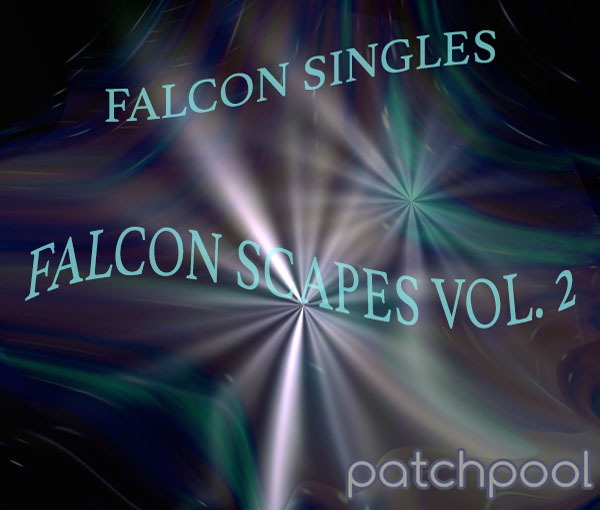 The demos were produced using only patches from Falcon Singles – Falcon Scapes Vol.2, no post-processing was applied apart from a limiter on the master output. Video demos are coming soon.